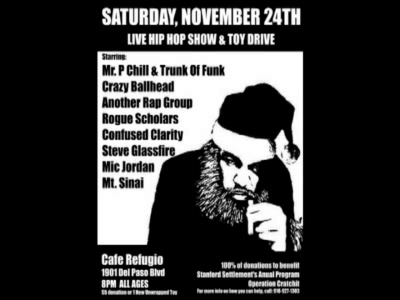 On The Spot - Live Hip Hop Show & Toy Drive - Featuring Mr. P Chill & Trunk of Funk, Crazy Ballhead, Another Rap Group, Rogue Scholars, Confused Clarity, Steve Glassfire, Mic Jordan, and Mt. Sinai. Hosted by MC QBall. Filmed and Edited by Matthew Hollstein for 916groove.com.